For some reason, blogger thinks this image works better on its side. But you can tell that it's done. 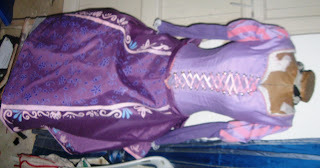 The last step was to finish all the grommet and the sleeves, and to lace the bodice up. 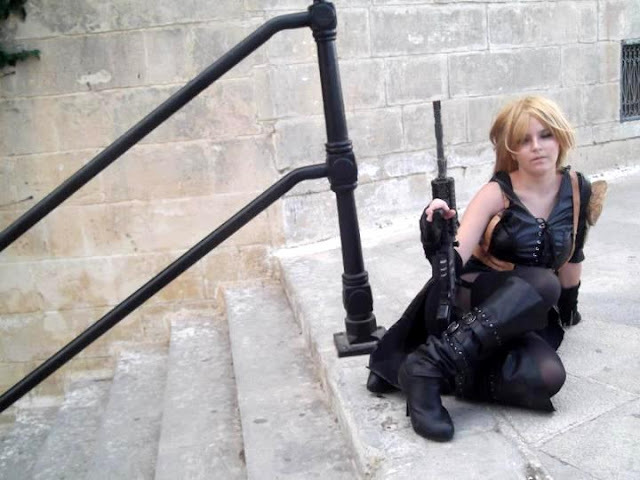 Hopefully I will be able to organise a photoshoot with this dress, because it deserves some good pictures. 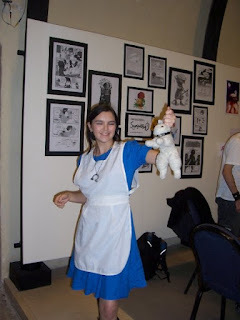 I have also had the opportunity to update my Alice Liddell (American McGee) costume. 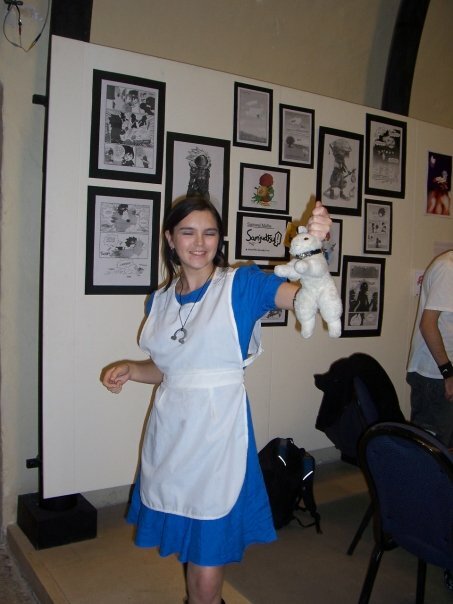 This was my first ever cosplay, so I didn't sew it myself. Instead I asked a local seamstress to make it out of the materials that I bought, which consisted of a lovely blue linen, and an old white apron. Not bad, but not entirely accurate either. So I decided to make it more accurate. The dress is more or less perfect, but the apron needed alteration. Once again, blogger messes with my images. 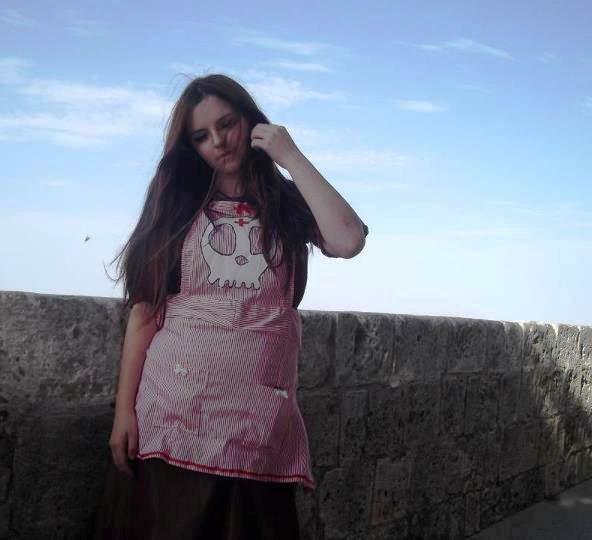 To get the apron the right shape, I place it on my dress form. On one side, I drew a diagonal line to get the shape of the apron. I unpicked the stitches that secured the skirt of the apron to the waistband, and cut the diagonal line. I did the same to the other side. The raw edges were sewn over with a zigzag stitch, then I folded them over and top stitched. This process was repeated for the top front and the back of the apron. For the bow, i first altered the waistband so that it closed with snap, then I made a bow out of an old white shirt. The bow is attached to the waistband with a snap. The skull is paper mache: loo paper soaked in PVA glue and moulded into the right shape. I then painted it with acrylic paints, and added a coat of spray varnish. I also made the pockets out of scraps of white material, painted on the symbols, and sewed them on. The blood is watered down acrylic paint. I made it too runny, so I had to touch up the blood spots to make them darker red. Two weeks ago, I had the opportunity to get some good photos of two of my costumes at a local cosplay meet up. The one thing that irritated me about the meet up was the sheer lack of people in costume: is it really that hard to dig out a steampunk themed costume? To be fair, my costumes weren't exactly steampunk: Sweet Pea and Dinah Wherever; but at least I made an effort. This is my Dinah Wherever (Bizenghast) costume. I've mentioned it before on this blog, but never had any good pictures of it. The dress is made of a skirt suit, and the apron is made from an old long sleeved shirt. The skull is painted on with acrylic paint. These pictures were taken on the bastions of Mdina. I also managed to get some good Sweet Pea pictures. 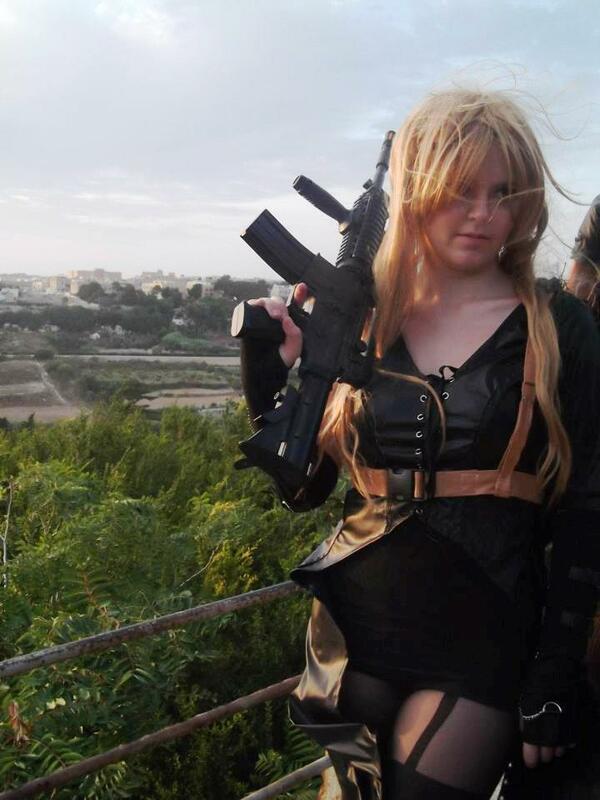 I added a gun belt, a leotard and new tights to the costume. I also borrowed a pellet gun. That darn gun weighs a ton. I am so glad my friends helped me carry it around, especially since I already had two costumes to carry around for the photoshoot.